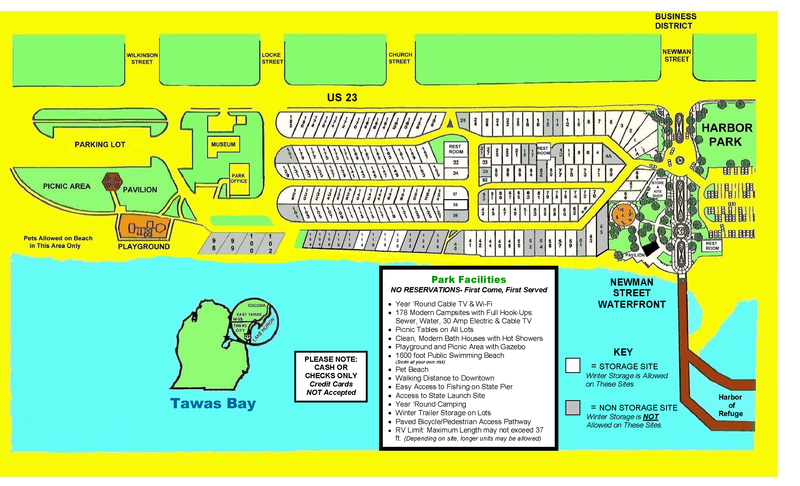 Nestled in the heart of Northeast Michigan’s Vacation Wonderland, the East Tawas City Park campground is located on beautiful Tawas Bay in downtown East Tawas. The campground, adjacent to the East Tawas Harbor of Refuge and the East Tawas downtown business district, is open year around and operates on a first come, first serve basis only. Come and stay with us for a day, week, month or all year. We also offer an onsite winter storage program from October 15 to May 1. Check us out. We think you’ll like us. RV Limit: Maximum Length On Most Lots May Not Exceed 37 ft.